I have never heard of or even tasted Russian mustard. Stronger than Polish or French mustard (frankly not strong at all) however not nearly as strong as Colman's. Musztarda rosyjska is usually wholegrain. I just checked - Russian type has 3 chillis sign on the label and is made from black mustard seeds - without exotic additives. I used to buy it, if I could find it. Interestingly I bought some English mustard in the UK (not Colman's) to bring back to PL. When I read the label, it said "Made in Poland". mustard made locally in Krakow, they add honey to it. That sounds a bit like Süßer Senf. I've had it, but wouldn't know what to serve it with. but wouldn't know what to serve it with. Yes, it is because they always add vinegar or citric acid to mustard. Any mustard. 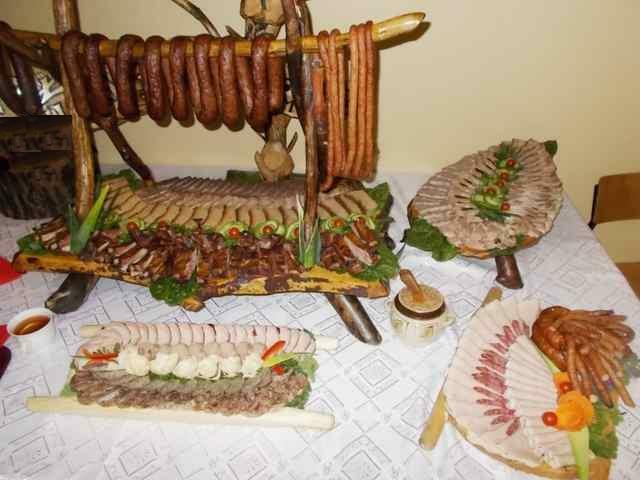 Polish sausage is my fav. Fried is the best. Here with onion. 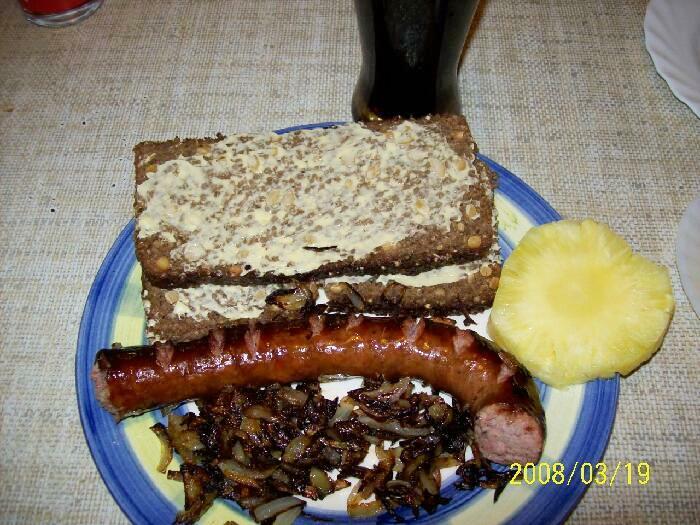 The sausage, onion and bread look great! Yes, I sometimes have crazy tastes,. Whenever my poor wife saw such stuff, she used to go out of the kitchen. :):) Now she is accustomed. I told you I have a sweet tooth! I actually like the idea though! I'm going to test it tomorrow, because that combination actually sounds quite tasty, especially with well done onions on top. 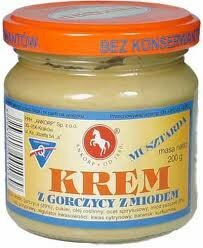 Polish mustard made locally in Krakow, they add honey to it. It does sound a bit of an odd combo, but then I've always thought the same about gammon and pineapple eaten in the UK. Recently sampled some wedliny at a Polish fair here in New Jersey! sampled some wedliny at a Polish fair here in New Jersey! Religious holidays - OK... but knowing what I know now - no processed pork otherwise for my family thanks very much. (and legally) get my hands on, thank you!! Add to that, "well and HEARTY"!!! 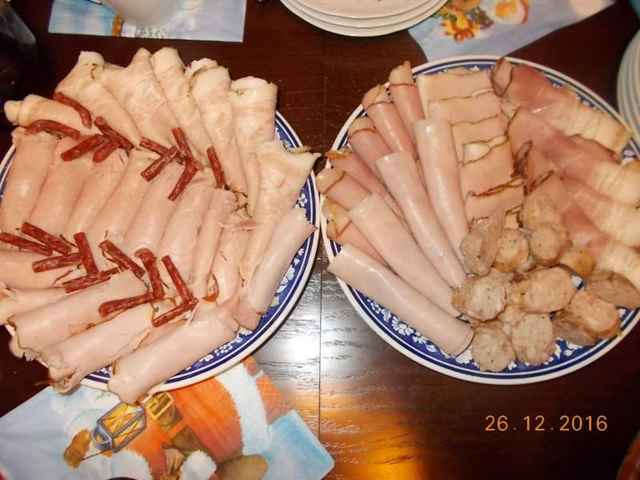 I am sad to hear that you suffered bowel cancer Doug,one of my uncles had it,he too ate a lot of cured meats. But I and many people I know have eaten it almost daily with no ill effect. We all gotta go one day...the best thing is to do everything you want in moderation, I am sure that a contended life increases longevity. Are you aware that lung cancer amongst non smokers is on the increase? Sometimes, doing all the right things doesn't save you. Actually, that pineapple wasn` t a joke. 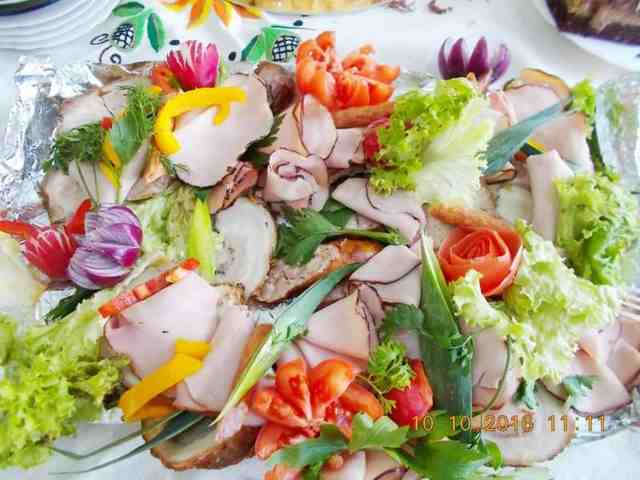 I sometimes eat fresh pineapple with fatty meat dishes because the fruit contains beneficial bromelain which helps in better digestion of protein. 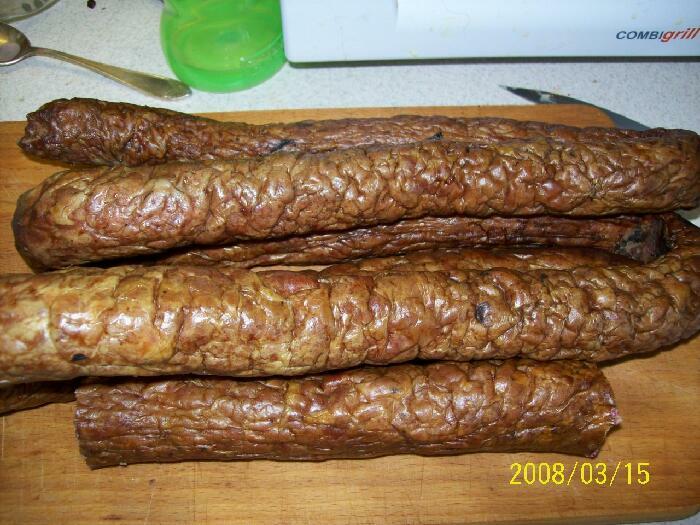 Polish "wedliny" results in at least 20 percent higher incidences of bowel cancer. Yes, but Lyzko and me simply can`t resist. Let` relive those wonderful moments again. As Milo said, life would be so boring without them. 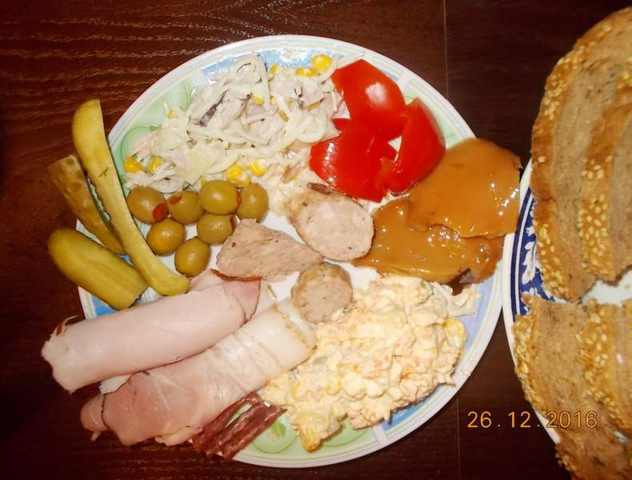 Every plate looks delicious Pawian. Yes, exactly, but as Dougpol mentioned, it is all processed and cured pork. . The non-cured one is available but not too popular. Sorry to disabuse you Milo. It was my mum I was referring to. I would have swapped places with her if I could - but of course anybody would think the same. There's no good way to lose that person who brought you into this world. PS That's why I love Easter so much. It's like a rebirth; whereas catholics have All Souls Day, I prefer to celebrate my parents' memory at Easter. Garden and sun, and all that.